On October 6, attorneys Mel Hess, Peter Kraybill and Justin Bollinger rappelled 11 stories down the side of Ruoff Tower in Lancaster to raise funds for SouthEast Lancaster Health Services (SELHS). Sponsoring the SELHS Over the Edge fundraiser entitled GKH to one rappeller. 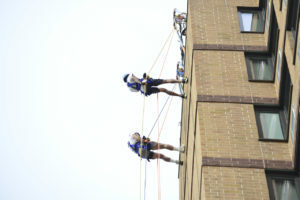 Attorney Hess accepted the challenge, quickly raising enough money to allow two more rappellers for Team GKH. Attorneys Hess, Kraybill and Bollinger raised a combined total of $5,305.00 in support of a hardworking nonprofit that provides a wide range of health services to 22,000 of our neighbors here in Lancaster every year. Mel Hess was the event’s second highest fundraiser, with his supporters contributing a total of $3,715.00. Friends, co-workers and clients may continue to support Mel, Peter or Justin by contributing via their fundraising pages by the end of the day on Monday, October 16. Contributions help promote and ensure the continuing health of the greater Lancaster community. Many thanks to all who contributed, and to those who came out to cheer them on as they made their descent.